This Chicken Marsala recipe uses a whole chicken surrounded with vegetables and stuffed with fresh marjoram all roasted in Marsala wine. 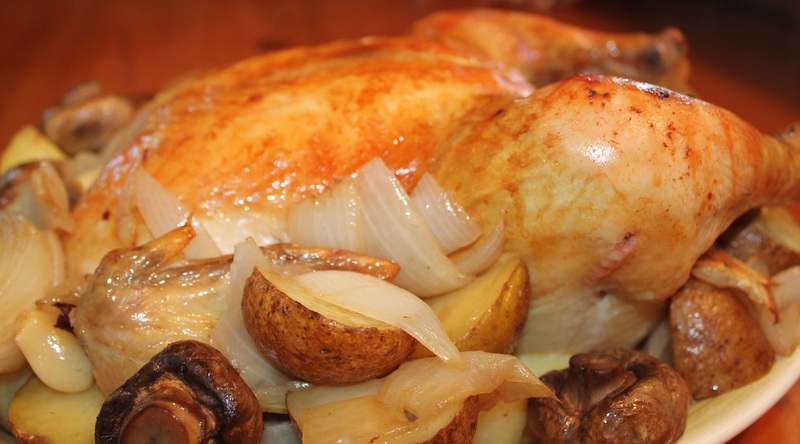 The wonderful aroma will fill the house as your dinner roasts. You can make a sauce if you like out of the pan drippings, but I have to say this is really flavorful without it too. Pre-heat oven 425 degrees. Wash and dry chicken removing neck and gizzards. Place fresh marjoram sprigs inside the chicken cavity and put chicken, breast side up, in roasting pan with shallow sides. Pour chicken broth and Marsala over the entire chicken. Place chicken in oven on lower-middle rack. Baste every 15 minutes. In large bowl, mix vegetables, oil and marsala. After the 2nd chicken basting (30 minutes cooking time) arrange the vegetables around the chicken. When the chicken is done, remove it to a serving platter and cover with foil. Stir vegetables well and place them back into the oven (minus the chicken and liquid) for 15-20 minutes. Arrange vegetables around chicken and serve warm. To make Marsala sauce use 1 cup of reserved liquid (add additional water if needed) and 1/4 cup non-fat plain Greek yogurt, simmer sauce. Add a mixture of 1 tablespoon cornstarch and 1 tablespoon cold water, stir until thick.